Disposable — cleanup is easy! If you're searching for simple, disposable round tablecloths for your next event, these are exactly what you're looking for. 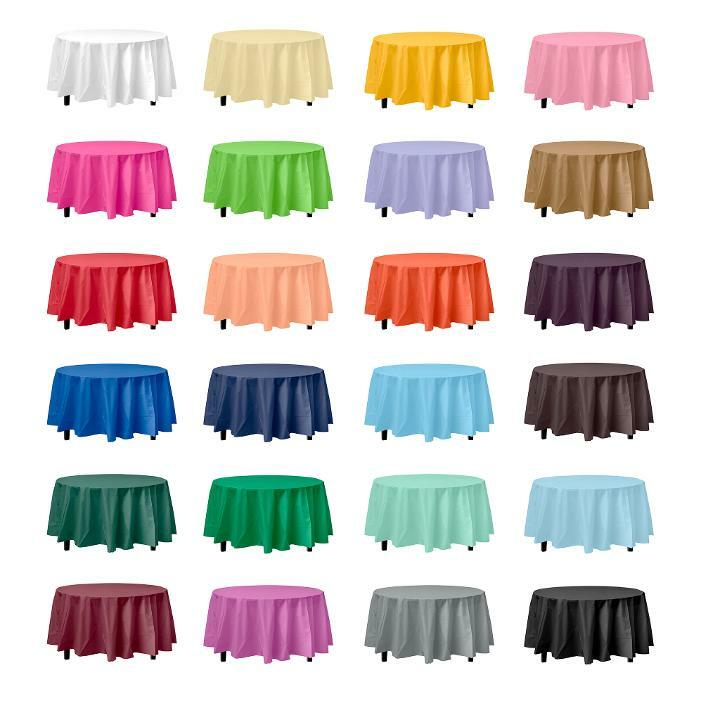 These tablecloths are made of plastic in a variety of thicknesses and colors that are sure to make your tables look great and keep them safe. Use them for a wedding, birthday party or banquet! The options are endless with FDP. I used this tablecover for my bridal shower. The color looked really spot on with my theme colors ( silver and black and gold) and clean up was a breeze because this held up really nicely and didnt shred! Will recommend! I bought this orange colored table cloth to use for a dinner party i was doing. Everyone loved the color and wanted to know where to get it so i told them. The quality held well too. I used this table cover when we had friends over for lunch...it made such a neat presentation. Everyone loved the way it looked...we were able to wipe off spills right away. Although it is disposable it still looks new!! I can use it a few more times Worth the money. I've been buying a lot from this site. They never seem to fail me. Delivery is on time and the products are wonderful. Definitely better quality than local dollar store table covers! Used for a 16th bday party- most of them held up quite well and can be used again. Not see thru like most in this price range. Bought Black and Magenta and both fared the same. Would buy again for sure! Shipping was pretty fast too! Great value for the money! Not the thickest out there, but definitely worth the price for a disposable. The color is beautiful and super accurate (I got both Cerise and Pink), and the quality is great! Super fast delivery as well! Can't wait to use them for my baby shower! Awesome value. Definitely a return customer.